Finding a healthy meal is getting easier and easier, especially with the advent of technology and the current trends shifting towards healthier ingredients and more balanced diets. But what exactly does constitute a healthy, balanced meal? There is no clear-cut answer to that question, and perhaps the reason for that is that itâ&#x20AC;&#x2122;s the wrong question! 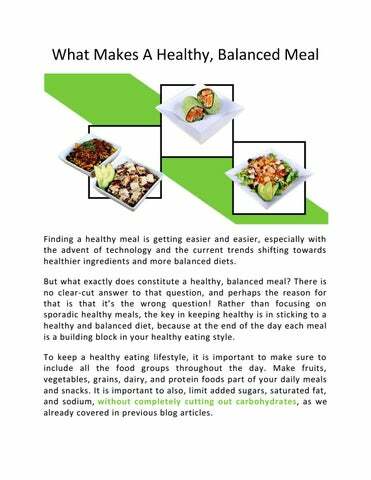 Rather than focusing on sporadic healthy meals, the key in keeping healthy is in sticking to a healthy and balanced diet, because at the end of the day each meal is a building block in your healthy eating style. To keep a healthy eating lifestyle, it is important to make sure to include all the food groups throughout the day. Make fruits, vegetables, grains, dairy, and protein foods part of your daily meals and snacks. It is important to also, limit added sugars, saturated fat, and sodium, without completely cutting out carbohydrates, as we already covered in previous blog articles. Try to make half your plate veggies and fruits! Vegetables and fruits are full of nutrients that support good health. Choose fruits and red, orange, and dark-green vegetables for best results! Include whole grains! Whole grains provide more nutrients, like fiber, than refined grains! Therefore, try to make at least half your grains whole grains, if not more. Look for the words “100% whole grain” or “100% whole wheat” on the food label. Your body needs protein! Add lean protein such as lean beef, pork, chicken, or turkey, and eggs, nuts, beans, or tofu. Twice a week, make seafood the protein on your plate to change things up. Extra fat is not good for you, and most of it is hidden in gravies and sauces! Using heavy gravies or sauces will add fat and calories to otherwise healthy choices. Try steamed broccoli with a sprinkling of low -fat parmesan cheese or a squeeze of lemon, and beware of the extra fat salad dressings that are most commonly used. Learn to shop for the right foods! Take control of your food so you know exactly what you are eating. 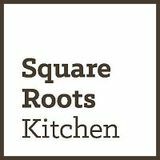 If you eat out, check and compare the nutrition information (at Square Roots Kitchen our kiosk ordering system and app does it for you!). If you’re buying groceries, read the labels of the products you put in your cart and choose options that are lower in calories, saturated fat, and sodium. Be adventurous, and try new foods! It may be hard to break out of eating habits, but being adventurous and open to new foods can lead you to a healthier eating lifestyle. You may find a new favorite, or a healthier substitute for ingredients you had been using your whole life. Trade fun and tasty recipes with friends or find them online. Have a sweet tooth? Satisfy it in a healthy way! Having a sweet tooth is ok, we all get those cravings at some point. Instead of diving for the biggest ice cream tub in the freezer, try to indulge in a naturally sweet dessert dish such as fruit! Serve a fresh fruit salad or a fruit parfait made with healthy yogurt. For a hot dessert, bake apples and top with cinnamon, rather than an entire apple pie with sugary, fat-full crust!